Owner Sophie Chedley, Stylist Laura Ginks and Jnr Stylist Emma Walker. Pic by Dave Charnley. 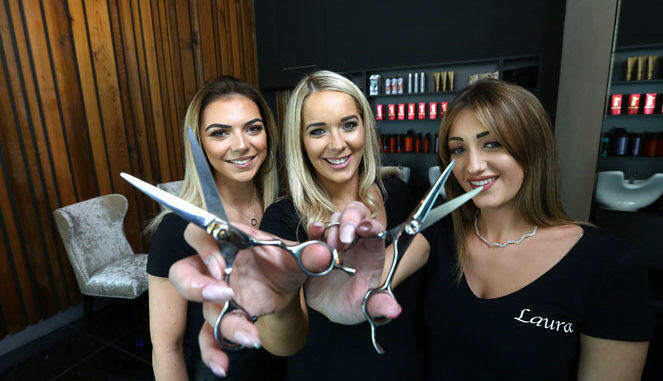 A hair salon that outgrew its former premises is looking forward to settling into its new home in the Redcar and Cleveland Leisure and Community Heart. The Salon, which started life at Tuned In!, has taken up space on the ground floor of the Heart to help expand the business, which was full-to-capacity at Tuned In!. Sophie Chedzey, the owner of The Salon, said the good relationship she had built up with Redcar and Cleveland Council’s Strategic Assets team meant the move from one council-owned building to another was an easy decision. She added: “Starting out at Tuned In! was perfect for me as it grew the business. “When we were looking to expand I was shown the unit at the Heart and it just made sense, it’s in a perfect location and it is a brand new building so there was the opportunity to put my own mark on it. The grand-opening at the Heart was held in June, only three days after Sophie left Tuned In! for the last time and only two months after she signed the lease on the ground-floor unit. Sophie’s arrival at the Heart means the business centre is now 87% full, with companies ranging from physiotherapists to couriers choosing to set up shop.